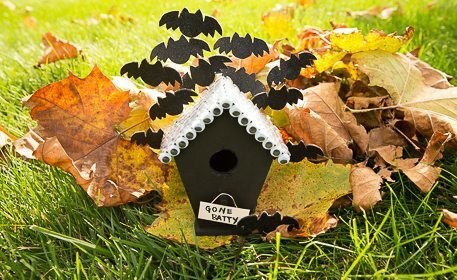 Turn a plain wooden birdhouse into a haunting Halloween decoration covered in flying bats and wiggly eyes! 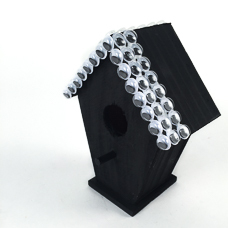 Once the paint is dry, glue 10mm wiggly eyes onto the birdhouse roof. Tip: Glue one side of eyes on the roof, lay on opposite side to dry and then repeat on other side to keep eyes from sliding off. 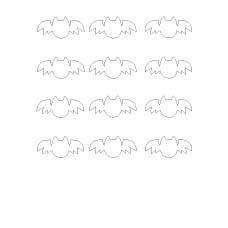 Trace 12 bats onto black glitter foam sheets. Use white chalk or a white colored pencil to make it easier to see the outlines. 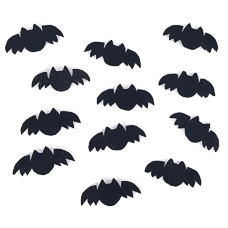 Tip: If you do not have black glitter foam, plain black craft foam will work just fine and you can always add black glitter to make your bats sparkly! Carefully cut out the bats. 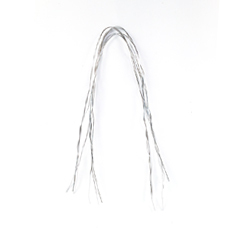 Cut 6 pieces of silver craft wire, about 16 inches long. Once all pieces are cut, fold them in half and twist them together. Separate the wire strands into 6 groups of 2 and twist each group together. 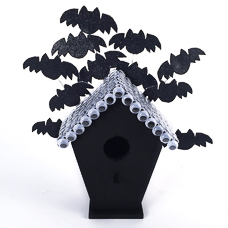 Glue the craft wire to the back center of the birdhouse, then glue bats to the wires in your own pattern. 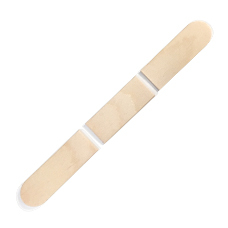 Cut a jumbo craft stick, as shown. 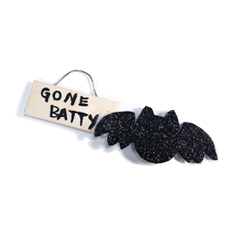 Use black paint and a thin paint brush to write “Gone Batty” on the front of the sign, attach a short piece of wire to the back of the sign, and glue a bat at the bottom right corner. 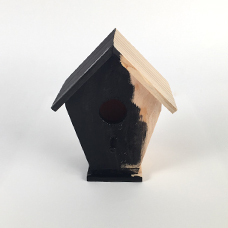 Hang the sign from the birdhouse perch.